randomGaussian() is a function that gives you a random number from a normal (0,1) distribution. This means that the average of all returned numbers is 0 and that almost all values are between (-3,3). Actually you could get any value but values outside of the (-3,3) range will be rare. Generally it&apos;s primarily used to distort rendered points or to blur things. 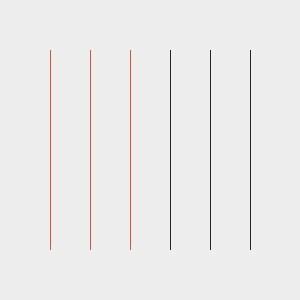 Let&apos;s start with rendering lines. But we will not simply use the line() function; instead we will draw them point by point. 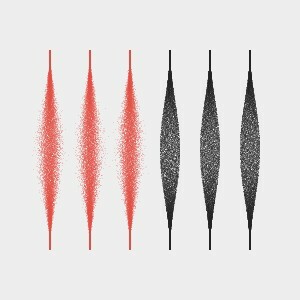 Now let&apos;s distort the red points with randomGaussian() and the black points with regular random() to illustrate the difference between the two functions. You can easily see the difference now. 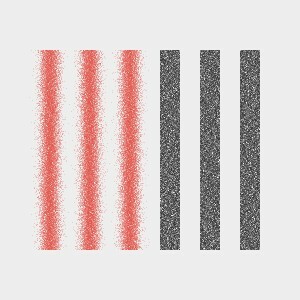 The pixels of the red bars are concentrated near the middle while the pixels of the black bars are uniformly distributed. We&apos;ll add one additional modification to get a more interesting effect. In the following example we&apos;ll render a square from points and use randomGaussian() to spread the points on each frame. float s = 10*sin(step); this statement calculates the factor the value returned by randomGaussion() will be multiplied with. in this case s will sway between -10 and 10.